Recently, NIBBLE writer Leah Hansen joined a group of journalists on a press trip to Belgium. She came back very excited about the country, and used her camera to capture tips from everyday life. For a cheese board or a buffet, use fresh herbs to decorate cheese—and butter, too. 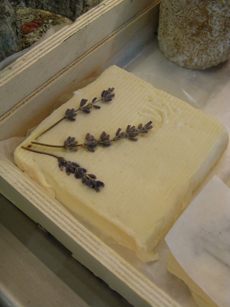 Press fresh herbs or flowers into soft or semi-soft cheeses before serving. Lavender (in the photo) and rosemary look pretty and add a layer of aroma and hint of herb flavor. Don’t limit yourself to these choices, though: Use your eye and your palate to find herb-cheese pairings that please. You can turn cheese decorating into a party activity. Give each person or small group a Camembert or baby Brie to decorate. Provide some fresh herbs and whatever you have on the spice shelf. Serve the cheeses with fruit for dessert. Use fresh herbs from the market to decorate butter and cheese. Photo by Leah Hansen | THE NIBBLE. In Belgium and France, butter is the condiment of choice on a ham sandwich. 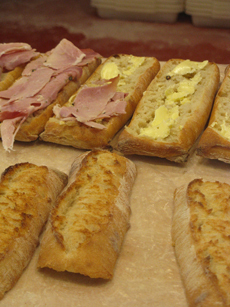 The flavor of unsalted butter with ham on French-style bread (you need good bread!) is very elegant. Try it. We add a bit of Dijon mustard as well. In Belgium, there is no such thing as a “Belgian” waffle. Every region has its own style of waffle (called a gauffre, pronounced GO-fray or GAW-fray) based on two major styles: the Brussels waffle and the Liège waffle. NOT FOR BREAKFAST. Belgians do not eat waffles for breakfast, but for dessert. What we think of as a “Belgian” waffle is the rectangular or square Brussels waffle. It is served with whipped cream and berries or other sweet toppings such as powdered sugar, ice cream, butter and sugar or syrup, with chocolate syrup or other fresh fruit; and is eaten with a knife and fork. SNACK WAFFLE. Liège-style waffles are enjoyed as a snack, and sold from street carts and in coffee shops. They are somewhat irregular in shape, although they are quasi-square or round. Here’s a photo. “BELGIAN” WAFFLE. The Belgian waffle got its name at the 1964 World’s Fair in New York City, where it was served with whipped cream and strawberries. The manager of the Belgian Pavilion, Maurice Vermesch, named it the Belgian waffle because he did not think many Americans were familiar with Brussels! Belgian waffles have deep divots—that’s the official name for the pockets or wells created by the waffle press. The batter includes yeast and beaten egg whites, which give the country’s waffles a lighter texture and fluffier consistency than the typical American waffle, which tends to use baking soda or baking powder in the batter. They are also very crisp. Check out all the types of waffles in our Pancake & Waffle Glossary.